Heart Necklace. Blue Willow Jewelry. Broken China Jewelry. Blue Heart. Handmade. Gift for Her. Fine Rolo Chain. Gift Box. Gift Under 20. 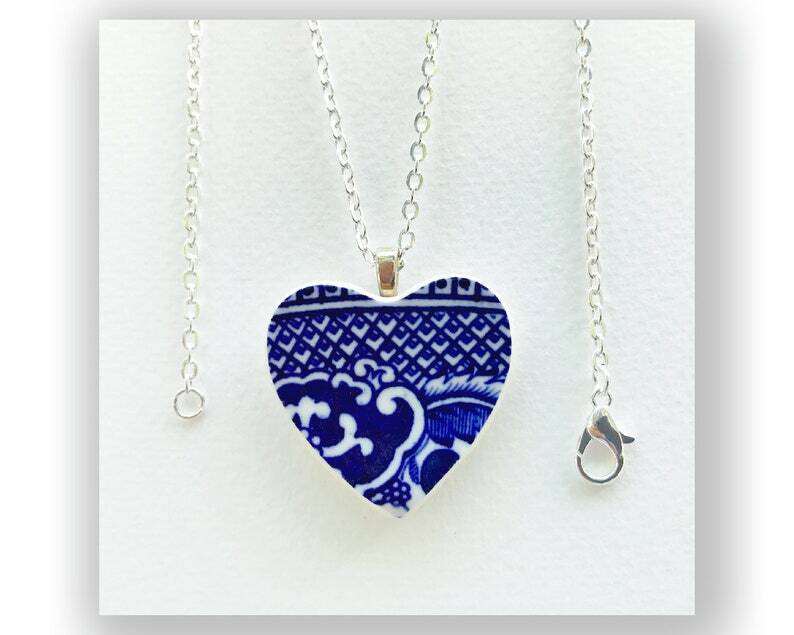 Pendant size: 1 3/8"x 1 1/4"
Show your love with this beautiful broken china necklace with silver plate bail and silver plate fine rolo chain. Hand made from vintage broken china, this unique necklace will be perfect for any occasion. Lovingly hand crafted one-by-one, this necklace is unique and timeless. Each piece of jewelry is handmade by this shop owner from her collection of old china. I can create multiples from the available china in my shop, or you can send me something that has special meaning to you. Jewelry cut from your own china is an extra special gift with sentimental value. To discuss further, send a message with your idea. Heart Necklace. Blue Willow Necklace. Broken China Jewelry. Blue Heart. Handmade. Gift for Her. Fine Rolo Chain. Gift Box. Gift Under 20. Heart Necklace. Vintage Blue Willow. Broken China Jewelry. Blue Heart. Handmade. Gift for Her. Fine Rolo Chain. Gift Box. Gift Under 20. Heart Necklace. Vintage Broken China Jewelry. Pink Rose Heart. Handmade Jewelry. Gift for Her. Fine Rolo Chain. Gift Box. Gift Under 20. Heart Necklace. Vintage Broken China Jewelry. Floral Blue. Orange. Handmade Jewelry. Gift for Her. Fine Rolo Chain. Gift Box. Gift Under 20. Holly Holiday Necklace. Broken China Jewelry. Christmas Holiday. Handmade Jewelry. Gift for Her. Fine Rolo Chain. Gift Box. Gift Under 20. Cross Necklace. Broken China. Blue Willow Jewelry. Unique Christian Jewelry. Jewelry Gift for Her. Fine Rolo Chain. Gift Box. Gift Under 20. Easter Gift. Large Cross Necklace. Broken China Jewelry. Christian Jewelry. Jewelry Gift for Her. Fine Rolo Chain. Gift Box. Gift Under 20. Heart Necklace. Vintage Yellow and Pink Roses. Old Broken China Jewelry. Handmade. Gift for Her. Fine Rolo Chain. Gift Box. Gift Under 20. It's a beautiful necklace. A gift for my cousin who uses her Blue Willow everyday. Can't wait to give it to her. Know she'll love it. Thanks,! Heart Necklace. Yellow and Pink Roses. Vintage. Broken China Jewelry. Handmade. Gift for Her. Fine Rolo Chain. Gift Box. Gift Under 20. Heart Necklace. White Heart Necklace. Broken China Jewelry. White Jewelry. Handmade. Gift for Her. Fine Rolo Chain. Gift Box. Gift Under 20. Heart Necklace. Yellow and Pink Roses. Broken China Jewelry. Vintage Handmade. Gift for Her. Fine Rolo Chain. Gift Box. Gift Under 20. Easter Gift. Cross Necklace. Broken China Jewelry. Unique Christian Jewelry. Jewelry Gift for Her. Fine Rolo Chain. Gift Box. Gift Under 20. Heart Necklace. Pink and Yellow. Vintage Rose. Broken China Jewelry. Handmade. Gift for Her. Fine Rolo Chain. Gift Box. Gift Under 20. Rose Heart Necklace. Vintage Yellow and Pink. Old Broken China Jewelry. Handmade. Gift for Her. Fine Rolo Chain. Gift Box. Gift Under 20. Holly Heart Necklace. Broken China Jewelry. Christmas Holiday. Handmade Jewelry. Gift for Her. Fine Rolo Chain. Gift Box. Gift Under 20.